Writer/director and producer Massimiliano Cerchi (Kendall Ransom: Bounty Hunter, The Night Shift) brings us a film that is a breath of fetid air in the thriller-horror market. As we take to the skies strange occurrences start frightening the passengers and crew to their wits end. Viewers will feel the claustrophobia of being stuck in a packed plane for an eight hour journey to London UK. It is late and Falcon Air Flight 88 is ready for boarding. Aeryn (Sadie Katz, Blood Feast, Wrong Turn 6: Last Resort) and Lynn (Chanel Ryan, The Late Late Show with James Corden, Bad Kids Go to Hell) are there at the door ready to welcome the 1st Class passengers, who at first seem to be characters of questionable morals. These are Mr Singh (Raj Kala, Hear No Evil), Nero Simms (Michael Wainwright, Altar), Adam Anderson (Michael Paré, The Lincoln Lawyer), Mr. Chase (Larry Fleming, The King of Bloody Fookin’ Britain), Clem ‘Smokey’ Williams (Scott Engrotti, Garlic & Gunpowder), newly weds Mark (Christopher Drummond, The Last Revenants), and Penny Tillman (Elise Muller, Deadly Beloved) then there is the aloof Rochelle (Crystal Santos, The Art of Fighting). Lynn Flirts with Smokey and Adam which annoys Aeryn as she has a thing for the dashing Adam and this sets tension between the two hostesses. 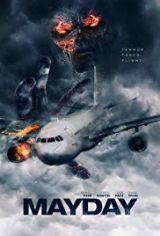 Flight 88 is in the safe hands of the stoic Captain Frank Perez (Vincent Rivera, Cruisin’) and Co-Pilot David Michael Esparza (Carlo Mendez, When It Rains), they are set for take-off, but they cannot until everything is secure in the main body of the plane. Lynn is having a problem with Mr Simms, as he won’t put his briefcase in the overhead locker or under his seat. Mr Chase says he could put it between them, but that doesn’t please Lynn. As this is going on Mark is trying to get his new wife to agree to be coming a member of the ‘mile high club’, which she find repugnant. Eventually Mr Simms is persuaded to put his case in the overhead locker, which he delivers with a kiss, before closing the locker door. Soon the Captain has the plane in the air and headed for London. It is not long into the flight and Mark and Penny are on top of each other, enjoying the trip to their honeymoon, the lights flicker and then they are out for a second. In that brief second Mark has vanished into thin air. Penny rightly panics, searching for Mark but there is no sign of him. This is where Adam steps in showing his air marshal badge. He organises the hostesses to search all of the plane and look for Mark as he tries to calm Penny, then he goes to see the Captain who isn’t for turning back. Now we are locked into an eight hour flight of claustrophobic terror. Can Adam and the crew keep calm as those around them could disappear at any moment and what is the cause of these events? Mayday is a great way to spend 75 minutes gripped to your seat. Watch this space for release details.